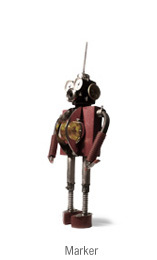 These were on Boing_Boing, but it's worth saying "take a look" here too: Bennett Robot Works. They're little robot sculptures. I want one or a half dozen.